Established in 2015 by the North Queensland Cowboys, our Foundation brings together an impressive 20 years of community leadership, corporate social responsibility and successful community project delivery. Our Foundation is built on an extensive track record of understanding and supporting the North Queensland community, on the respect and trust in our club and its players, and on the power of the one game and one brand that unites our region. 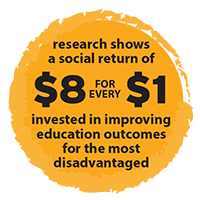 Developed in partnership with local communities, government, the private sector and philanthropic organisations, our results-driven programs continue to improve education, health, employment and social outcomes for young people in our region. 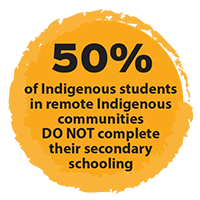 Some 50% of Indigenous students in remote Indigenous communities do not complete secondary school and, in more remote regions, have no access to secondary schooling locally. 154 primary schools in the North Queensland region have an attendance rate below the state average of 92.5%; 21 have an attendance rate of 85% or less. Only 57% of Indigenous students in the region progress from year 10 to completion of year 12, compared to 77% of non-Indigenous students. Only 17.1% of Indigenous students in the region achieve Overall Position (OP) eligibility compared with 54.3% of non-Indigenous students.